Doodle77 wrote: Also, HTML5 can't replace all that flash can do. b.i.o wrote: Microsoft's actions, as a corporation, are. Others have laid out the specifics. Of course, in this they're neither better nor worse than most other corporations. MS is different. How many other monopolies out there have used their power to drive out competition? Don't worry about it. You're not going to get big without some serious effort to be that way. Topic: Linux N00bs: Considered Harmful? Re: Linux N00bs: Considered Harmful? Xanthir wrote: You... didn't actually read Berengal's post, did you. Yes I did. And then I reread it after your post. I stand by my post. aleflamedyud wrote: Kafir, I think it's time religion drop-kicked you in the back of the head. Now see where that gets us? Do you really want to go there? If you look at the page I'm pretty sure that is not Apple's machine. If you want to ensure you can sync/backup contacts, look at the list of phones supported by the Nokia PC Suite. Mighty Jalapeno wrote: Dawkins was correct, but a douche. Why is Dawkins a douche? 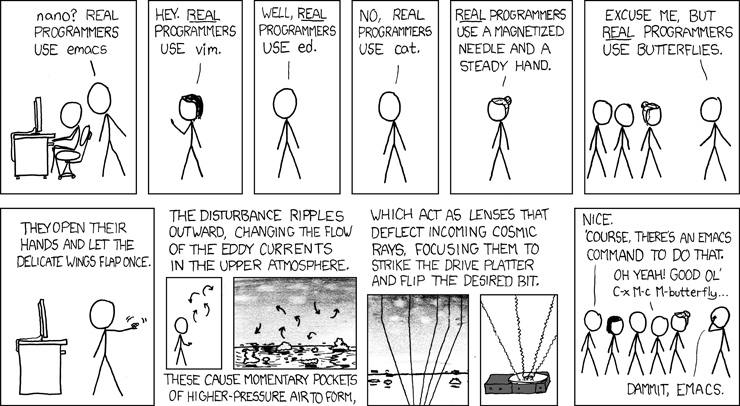 You're probably taking the quote out of context and reading it wrong: "real programmers' editors". But your criticism still stands. Just tried it using the Codeweaver package on Debian. I like it. I'm getting rid of FF as soon as Chrome is native on Linux. I might even ditch Safari at home, depending on whose JS VM is better. FF3 has been a crashy POS for me. Can't wait to delegate it to "for development purposes only". OK, so what does Linux do better than OS X? tea - usually some sort of chinese tea. So no sugar. It doesn't need it. coffee - depends on the bean. usually light roast single origin for short blacks or plunger, for milk something darker, probably a blend. Topic: Antivirus program for windows yes? no? if so which? Re: Antivirus program for windows yes? no? if so which?